Print version is coming soon! We used this book as a family devotional. Each week, we broke from our usual family time and we would read a story and answer the discussion questions from Asia: The Peoples and History. My husband and I want our boys to have an understanding of other peoples and cultures. Life is so different when you live outside of the United States. We want them to know that not all the world has three or four Bibles to read or church buildings to meet in each week. Living in other cultures can be very difficult. We are involved with a mid-week children’s ministry with our church and have been studying the missionary journeys of Paul in Acts. Our study of Asia: The Peoples and History helped us see that the need for the gospel hasn’t changed since the time of Paul. People today still need to know about Jesus. Bonnie Rose Hudson uses vivid imagery to help your children experience what people in Asia experience each day. You will learn a bit more about the history of each country you study. There are also activities to help reinforce learning about each country and answer keys are included. This book has studies on the following countries: Laos, Bangladesh, Napal, China, Iran, and Vietnam. If you were to follow a weekly study program the book would cover sixteen weeks worth of lessons. My boys (ages 11 and 7) enjoyed the stories and activities each week. They were always a little sad when a story ended, they wanted to hear more about the characters! My husband and I enjoyed listening to the boys answer the discussion questions. It was exciting to hear how they are growing and interpreting the world around them. I think the best part for me, was hearing how they incorporated these lessons into their prayers. With each new country we heard them include requests with their nightly prayers. It is a blessing to hear your child pray for people and places that need the Lord. I encourage families to think about purchasing this book as a devotional study. 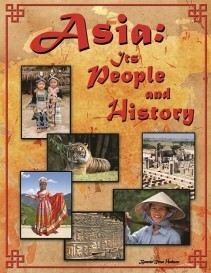 It is a fantastic way to help your children learn about the people of Asia. As a family, we decided to offer up a list of countries for Ms. Hudson’s next book. We were thinking we would like to know more about the people and believers in the Philippines, Japan, Afghanistan, Cambodia, India, Kazakhstan, and North and South Korea. What countries would you like to know more about? Now, after this review, I feel like we have two friends named Zane, and one of them has the last name Education. Zane Education is an online learning website created for the whole family, especially those with visual learners. It is also helpful to those who have families with special needs. Learning can will happen away from the textbook with Zane Education. Zane Education combines informative video clips to watch, and online interactive quizzes to help parents determine if their child is understanding the subject matter. This video learning site is quite extensive. Our review period has barely afforded us the time to view all that is available….. the video catalogue is 41 pages long! We enjoyed watching the subtitled videos, all the videos…. even those that weren’t in our age range. We watched lots of Science videos that were geared for older students, we loved them and even tried to take a few of the older tests. Let’s just say that these tests are not wimpy tests. I had to step in and finish taking the test for Hunter, and I flunked them…. there were words on that quiz I couldn’t pronounce! When your children pass these online quizzes, they will really know their stuff! All of the videos contain subtitles to help a child with their reading skills. I understand the idea of that……… but something tells me that for my kid…. he isn’t looking at the words….. he is just watching the show. I guess the theory is that just the subliminal sight of the words helps to improve reading. I am not sure I completely buy into that theory for my child, but if you would like to read more research and decide for yourself, you can go here to read more. Zane Education is committed to bringing a complete and comprehensive educational choice to homeschoolers for an affordable price. With the exception of the online subtitled video library which is a Premium Service, all of the other resources/ videos provided on the website are free to use after a user has completed the Registration form for a free Basic Membership. And yes, even the Math videos (without subtitles) are free to use. This Basic Membership Level would be a great place for you to begin if you would like to experience the website for yourself. GOLD MEMBERSHIP provides access to the videos for all topics at just $17.99 per month or $197.89 per year. SILVER MEMBERSHIP provides access to the videos for all topics in a particular Age/Grade at just $12.99 per month or $142.89 per year. BRONZE MEMBERSHIP provides access to the videos for all topics in a particular Subject at just $8.99 per month or $98.89 per year. Each Membership Level is good for use with your ENTIRE family, regardless of how many students you have. Zane Education is currently offering a 35% discount on the purchase of any annual 12-month Gold, Silver or Bronze Membership subscription. This discount is valid through until the end of August 2012. Use the coupon code: ZE643HSM at check out to obtain your discount. Overall, we liked using Zane Educations Visual Learning Website. It was easy to navigate, videos were easy to find by grade or subject level. It was a great way for use to have learning through the summer months without having to plan, organize and teach the lessons myself. During the school year I can see us using the site as a resource to learn additional information that might not be covered in our usual studies. Please visit the Zane Education website to see the extensive resources that are available to help you and your child succeed. Disclaimer: I was given access to Zane Education’s full premium website ( Gold Membership) for one year, free of charge, for the express purpose of this review. No other compensation has been received, all of the above opinions are based on the use of this program within our homeschool environment. it is Super Duper easy to build listening skills! I know I am the only parent with a child that “doesn’t listen”. I am convinced that I am the only parent who tells their child to do three things and they can never remember the list, they somehow thought I said play with your Lego’s between pick up your room and bring out your dirty laundry, and go outside between finish your math and empty the dishwasher! Wait…….. What was that? That happens at your house too? I am so relieved! I thought it was only me! Now that I know you share my angst over a child who has trouble following a list of instructions…. I am very happy to share with you a great game that will help your child build and improve their verbal recall and auditory comprehension. Hear Builder Auditory Memory Game is a fun way to build listening skills. Created for optimum use by the K-8 crowd…. in our house we found all age levels, even dad, crowding around the computer to watch and play. We reviewed the HOME EDITION of this game and it is available for purchase for $69.95. You can use the Home Edition CD-Rom game with up to four students, and customize each one’s level of play. Playing this game has given Hunter some tools to help him remember long strings of numbers, He really likes all the word games and I have seen great improvement in his predictive reading skills. We learned that he remembers his number sets better if he sings them. Both the Word games and Number games come with Memory Strategies that will build confidence and skill as your child uses them. When I told him that we were going to be reviewing a game that helped build listening skills, he balked. He looked at me and with his razor sharp wit, sarcastically bantered, “You asked for this so I could listen and obey better, didn’t you?” To which I replied, “No, but I am hoping it is a glorious side effect.” In true pre-teen fashion he rolled his eyes at me and began to play the game….. his first session lasted nearly an hour and a half. It sucked him in and he forgot it was a learning game. He enjoyed himself so much! I have heard him shout ” I am a lean, green, listening machine!” as he gets levels correct, and moves through the game. One cautionary note to parents who may start with an older child. Do not set the level of play in the game to all levels. Hunter was frustrated at about level 13 in the numbers game when we did that. I went in and created a new player with a beginner level, and the game was much easier for him to adjust to. Make sure you start slow so you don’t frustrate your child on the first day. If you are looking for a self paced, non threatening way to build your child’s verbal recall skills, Hear Builder Auditory Memory Game is my recommendation. Many of my fellow Crew Mates reviewed different products from Super Duper Publications. Please follow the link below and see if there are other products that may bless your family as you homeschool. I received a copy of Hear Builder Auditory Memory Game ( Home Edition ) free of charge, expressly for the purpose of reviewing this product. NO other compensation has been received. All of the above opinions shared are a result of using this product in our homeschool environment. It is one of those things that we want our children to do well. Have any of you run into a child that just detests the written word? You know, the child that cries, whines, feigns the flu, begs to clean their room, ….. anything to get out of having to write you a well formed sentence, or heaven forbid, a paragraph. This aversion to writing can creep up early and for my son (4th grade) it is because writing something down takes too much time. He would rather be playing than writing me a paragraph about the book he just read. I remember with my older two children that in the middle school years we spent many hours learning how to write. My goal was for them to be able to articulate themselves well upon their arrival into college, and with one in college at 16, I guess I did alright. I would like to share with you my experiences with a new writing curriculum, geared to students in the middle school years. The publishers of God’s World News and WORLD Magazine have developed a very engaging writing program. It does something that other writing programs miss. It engages the students by allowing them to write about real things they experience everyday. This isn’t a curriculum that has them writing about bugs, or the weather, or their favorite color; this curriculum has them writing about what messages an advertisement is trying to send them. Rather than teaching adverbs and adjectives by just explaining the written words on the page, Write with WORLD uses pictures and asks the student to describe what they are seeing as specifically as possible…. then building to the point where sentences are used to create vivid visual images for the reader. It approaches writing from a journalistic point of view, while teaching grammar and mechanics in a very conversational style. If you would like to see the full table of contents the curriculum covers, you may find it here. I think that this curriculum would be great for those families with children in grades 4-9. It would be very easy to work on this curriculum as a group. The daily capsules (lessons) are quick, and require very little pre- prep time. You could spend about a 1/2 hour a week prepping for the weeks work, and it would be easy for you to ask an older child to skim through the teachers book and gather what might be needed. The book often refers a student to find an article in WORLD magazine to work from, we do not subscribe to that magazine, and had no trouble at all finding alternate articles or photos from other sources. I would like to offer a suggestion to the creators; providing a table of contents or a materials list for the teachers book stating how many articles or other things we might need for each lesson, would certainly improve it’s functionality for busy homeschool parents. Pricing is currently set at $95.00 for the student and teacher book. Both are NON- consumable, a student uses a separate journal to record their work. Non- consumable books tend to take the sting out of the price, you know you can use it again with another student or sell it later to recoup some of the cost. I encourage you to wander over to the TOS Homeschool Crew Blog, and see what other parents are saying about their experiences with Write with WORLD. as a TOS Homeschool Crew Member, I was sent Book 1 of Write with WORLD’s middle school writing curriculum. I was sent this book free of charge, solely for the purpose of this review. No other compensation has been received. You want my kids to practice arguing? To fully understand the title of this book, you must read the rest of it…… an Introduction to Informal Fallacies. This book is much more than the squabbles over who is going to play with what toy, or sit in what seat in the car. The arguments discussed in this book are very much about instilling a love of logic and critical thinking. I will admit, that logic and critical thinking were not a subject covered formally in my middle school years, at least not at the private school I attended. It was however covered very informally with my dad. He would take me places and introduce me to things, for the express purpose of thinking critically about it. He WANTED me to pick business presentations apart and have me tell him where they were flawed. We would discuss the way a presenter tried to sell one point or another; all the way home. The book, The Art of Argument: an Introduction to Informal Fallacies, is just like those moments with my dad, it uses scenarios and advertisements from newspapers and other media, to teach your child to think critically about all the images and audio they are bombarded with each day. It is written clearly and is very easy to understand. As I read through the Teacher’s Edition I didn’t end up dazed and confused wandering the house with glassed over eyes, wondering what it was I had just read. I understood it, and felt empowered to explain the concept to my 4th grader. Yes, you read that right, 4th grader. This book is marketed to Middle School children grades 6-8, however, with just a bit more conversation, and less book work, we made it very easy to understand for my 4th grader. We review what we have learned as we shop around town. We read billboards and ads in magazines as we are waiting to check out, and try to remember what fallacy they are representing. Hunter also liked the Disc 1 that Classical Academic Press included as a sample of their DVD set. It is a round table discussion on the fallacies that are discussed in chapters 1-6. Since Hunter is such an audio visual guy, having this as a resource was wonderful, he could watch it over and over, each time absorbing more and more information, similar to when he watches the same television program 700 times. I would offer up to you that if you choose to use it with younger children to take the information slowly, teach it in bite sized chunks twice a week, and talk about it often when you see something that would be an example in real life. Pricing: Always make sure you check with their website for any special pricing. Make sure you visit the TOS Homeschool Crew Blog to see what other families are saying about this product and Argument Builder, both from Classical Academic Press. As a TOS Crew Member I was given a copy of the Student and Teacher Text and Disc 1 of the set, free of charge for the purpose of this review. No other compensation has been received and I am only asked to write an honest review of the product. I remember, waaaay back in High School reading several classic pieces of literature in my English classes. The teacher always had a endless bank of questions that were designed to engage us in thinking about a book as more than just words gathered onto pages and creating a nice little read. We were challenged to look at the world through the perspective of the characters, to understand the when, where and why of the setting the author had chosen…. That was the stuff that made literature come alive for me. I will confess that it is the exact thing that gave me more than a bit of trepidation as a homeschooling parent. I didn’t know if I would be able to replicate the amazing-ness of my high school English teachers. To my rescue, comes the company Progeny Press. They sent me two of their literature study guides. 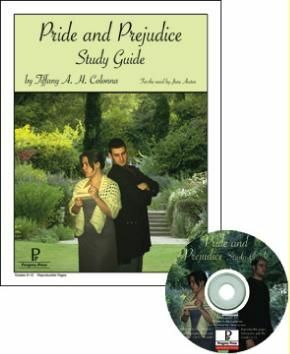 Pride and Prejudice for my High Schooler and The Bronze Bow for those in Grades 6-8. 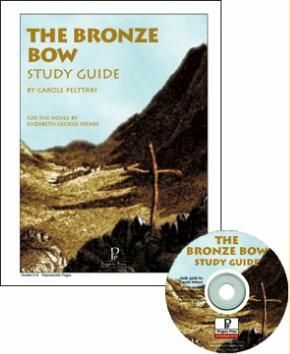 I primarily worked with Hunter (4th grade) on the Bronze Bow study guide, so I can testify that they are indeed appropriate for those in even younger grades than 6th. My daughter, Tayler, a Junior in High School, enjoyed going through the lessons designed for Pride and Prejudice by Jane Austen. It is one of her favorite novels; she has read it for pleasure many times. This was the first time she read it with literary analysis in mind. She found the questions thought provoking and felt that they helped her to delve into the characters more deeply. She really enjoyed working in the interactive PDF. She could pull it up on her laptop and not have to carry around a large printed booklet to work from. I especially appreciated the way it tied themes of pride, humility, control of one’s tongue to Scripture, and asked her to reflect on a possible different outcome of things if the characters had behaved according to Scripture. It really puts this great work by Jane Austen into a whole new perspective. Hunter and I worked through The Bronze Bow by Elizabeth George Speare. First, let me just say that this is a wonderful book. We are a little over half way through reading it and answering the questions in the guide. I had never even heard of this book until this review and I am very glad we had a chance to read and review this guide. The questions within the study guide are teaching him to pay more attention to the characters in a book; to ask himself questions about them, to infer, and predict. It is also building his vocabulary. For Hunter, we printed out several pages of the PDF file at a time to work on as we read each set of chapters. The study guide draws from Scripture and asks you to read an compare a passage from the Bible with a section of the book. We have really enjoyed reading the book and the time that it is giving us together as we work through the lessons. Progeny Press offers you a chance to look at samples before you buy. Pricing varies by what might be on sale, the grade level of the study guide, and the format that you would like to use. For example, I received The Bronze Bow via email; the price of the file would have been $6.95 + $3.00 processing fee, bringing the guide to a grand total of $9.95. The cost would increase if you wanted a CD or Booklet version. Please make sure you check their store for availability and pricing that would best suit your family’s needs. Honestly, $10.00 isn’t a bad price, not for something that I can use over and over and over with multiple children as they come along. It really turns out to be a great investment in your children to help them better explore literature through the lens of the Bible. I received two study guides from Progeny Press, free of charge, for the sole purpose of this review. The above opinions are my own and those of my family members who used the product. We are not obligated to furnish a positive review. No other compensation has been received.